In a saucepan combine the first two ingredients and bring to a full boil; Remove from heat, cool slightly & add 1 packet of unsweetened Kool-Aid or any other brand unsweetened drink mix. Use as desired over crushed ice or ice cream. 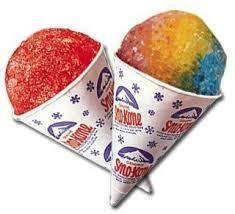 What are your favorite shaved ice flavors?